…and that’s before we get on to ingenious stained glass tools to fill them with. You know – the ones that you’ve made cheaply or adapted from something else. It’s such a thrill to make or find stained glass tools that work for you. Ever wished you could see a whole load of stained glass artists’ studios to see how they organise their spaces? Well now you can. Delphi Glass have put together this fascinating slide show of stained glass studio spaces entered for their “Most Organised Studio” competition. Hit the pause button if you want to have a good look at anything in particular. Which one do you envy the most? You’re welcome to add other ideas of your own below. Stained Glass Tools – Cheap Ones! These shelves will give you a lovely tidy mind which will spill over into your pleasure when you make stained glass. The board was about $10, and the dowels cost about $17. If you don’t have the time to make you own you can always buy ready made ones from Amazon here. I think you’ll agree they’re a MUST HAVE for all stained glass studio spaces. Gail says the rack is very strong and that “the dowels barely flex when several sheets of glass lean against them.” Thanks so much for sharing! P.S. Everything Stained Glass follower Janusz N has added a simple idea for racking. He uses a plate rack from IKEA for small pieces of glass and says “it is portable and works well“. I think we can see that below! Thanks Janusz. Buy a cheap a plastic storage box. Set the grinder in the box with the opening facing you. Having the top and bottom catches a lot of water and stops it going everywhere. Cut a small hole in the back for the cord to pass through. If you need to put the grinder away, turn the box back to the normal top up position and reposition the grinder in the box. Put on the lid and you’re ready to go. The splash guard works perfectly and costs less than any of the 3-sided items seen online. Thanks to Diane for sharing. Floyd T. Hopkins has kindly shared his idea for a splash guard too. Floyd uses a 20 gallon aquarium on its side. He says: “It’s clear and the lip works great for holding water” and suggests putting a LED light with a magnifying glass on top. Ingenious. Thanks Floyd! Oh yes, we’ve all been there… dirty murky water in your stained glass grinder and a mile to wobble your way to the sink to dispose of it… No longer! Thanks to Mitzi Mallon’s inspired idea you’ll be sucking up water from your grinder without making MORE mess in the process. 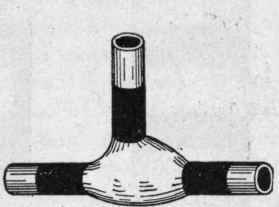 She uses this rather grandly named ‘Hydro Pressure Plunger‘, borrowed from the plumbing industry. Voilá! All your dirty grinder water is sucked into the pump reservoir. 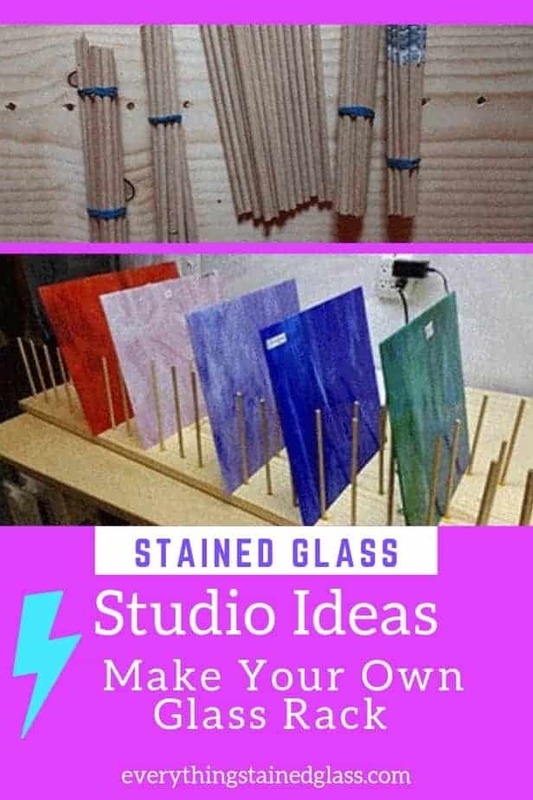 Any more ideas for stained glass studio spaces or cheap/adapted tools? Feel free to add them in the comments below. This page gathers ideas about stained glass studio spaces and cheap tools in one kid-in-a-sweet-shop-place. If you think it might be useful to others, feel free to Pin on Pinterest and Share on Facebook. Thanks. I store my sheets of glass in a hanging file folder that sits in a plastic milk crate. Each sheet has its own file folder and if I have a couple like shades I can combine them using a folder w/o the metal clips.The crates are the size the kids used to hold vinyl records. I have at least six of the crates and it is easy to locate the glass I am looking for. 20227 N. 126th Ave.Thanks for all the neat ideas for organizing our shops. I normally keep my leftover cut glass pieces for possible use in future projects. I use plastic bins with covers and label each box with basic colors and/or styles of glass stored in each bin. Makes it easy to find useable pieces without having to buy a new full piece. I wanted to share a couple of ideas that we have used in our class to store glass. One is using plastic shoe boxes for used glass. They are see through and sturdy, as well as stackable, and easy to mark what color of glass the box is holding. Another idea that I have been using for storing a sheet of glass is a dish holder. I also wanted to thank you for sharing so much useful information in regards to stained glass. I have shared your link with a few of the girls in my class, and they too have found your tips very useful. I hope this ideas are helpful for someone, and i look forward to receiving your emails. These are great ideas Dina, thanks so much for taking the time to share them. They’re very useful indeed. I am sure that I am not the only one who does this, but, will tell you anyway. I used to use the “plastic” trays that come with roasts/steaks for putting my cut projects in, but, at the Dollar Tree they have those rectangular little plastic baskets in all colors, 2 for $1 that are invaluable. Also, I have about 4, wooden crates, some highly decorated that I have bought @ garage sales/thrift stores. My hubby makes my frames for big projects as well as for the “fan lamp” bases & he also makes me the small “pushers” I use when grinding my glass (he is so supportive of my glass)! I am sure I am not telling you anything you didn’t know; have a great weekend. This is a great additional tip, thanks Sandra. It will be a new idea to someone ‘out there’ I can guarantee it! Hi Sandra, what do you use the little plastic baskets for? To save glass scrap? Do they have lids? Thanks! I don’t have much space, but I also don’t have a huge inventory of glass. I use pizza-type boxes labelled opaque, cathedral (clear coloured), pattern and clear. Not as elegant as being able to reach in and immediately get what I need, but it works for me. That’s a brilliant solution for a small workshop space, thanks Debra. My grinder sits in my laundry sink in utility room. Allows for fast & easy clean-up with no mess outside sink. I do have to lift out grinder when sink needed for other uses but this does not occur often. It worked so well I’ve rearranged my laundry room as my “studio”. I made a glass cube-like thing with four sides …and I put it down over the grinder. It works really well to keep spatter inside, and is large enough to enclose the grinder but small enough for me to be able to see what I’m doing. I’d show you a picture, but I’ve been unable to do glass for a while and the workshop has become a gathering place for other things so it’s hidden beneath all that stuff. The pictures of tidy workshops are an incentive for me to get back at it! Great ideas! That’s a good idea as you can make it the perfect size to fit your own stained glass grinder. Thanks for sharing Carolyn. I hope you’re able to resume glass soon. I use old steel office standup file organizers to sort and keep upright my stained glass pieces. They are heavily anchored on the bottom so it doesn’t tip over. Unfortunately they only make plastic file folder sorting trays now which tip easily. They easily hold a square of glass in place. Great idea for storing glass Geri, thanks for sharing it. Plastic is taking over the world unfortunately… perhaps once the glass is in it stabilises the files a bit? II have placed it on an open shelf, so I can look down into the organizers and easily pick the glass piece I want. That’s a great storage tip Lone, thanks so much for taking the time to share it with others. My issue with using the storage tubs or fish tanks is that I’m short and can’t see over the top when grinding. I’m also short on work space and with 3 grinders I don’t have room for the splash guards. I’m using “presentation” board cut down to height needed & cutout for power cords. I wear safety glasses as my shield and yes I do feel debris hitting my face from time-to-time. I’m open to suggestions. That sounds a good solution Bud. Kathy (further down this page) suggested a fish tank that you can see through. I wonder if that might be a useful idea for you? Try a full face shield similar to welding shield. Wood workers use them with turning lathe. They are light weight and cover your whole face. You can flip them up when needed. They fit very comfortably. Handy if you wear regular glasses. Your glasses stay clean. Oh that’s a really good idea, thanks for suggesting it. Hopefully Bud will give it a try. I use 2 3-ring binders standing up behind the grinder, and the grinder has a piece of clear floatglass protecting your eyes. The grinder and binders sit in a boot tray, the kind used to keep the melting snow from spilling onto the floor. It works for me! Hi Bud, great idea, but, for me, I feel like everything that people have said here, limits my movement cause I usually set my pattern/glass pieces on the left next to the grinder. Thank God my shop has a tile counter that I just wipe down. Good point Sandra. You’re lucky to have the tile counter as you say. I’ll second the 3 cheers Robert, I’m glad you liked it. Loved the idea from Diane about putting the grinder inside a cheap storage box and being able to use it as a cover for the grinder when not in use. That’s good to know Barbara. There’s nothing better than an organised studio for making you feel good…one step at a time! You’re welcome Richard, I’m glad you found it of use. Hi! Milly! I use a 5 or 10 gallon fish aquarium for a splash guard. They cost about 5- 10 dollars, are easy to clean and you can see through the top clearly. I have a small Battery LED that sits on top to give me great lighting where I need it. No wires for the light. That’s a brilliant idea Kathy, thanks so much for taking the time to add to it to the page. Looks great Milly!! I have just tidied my studio today – after a prolonged period of illness I suddenly feel I must get in there – but it had become a dumping ground! Still a way to go but a tidy studio is a great beginning to getting back into work I am hoping. I wish they were my studios but they’re not Penny! Delphi organised a competition a while back and people sent images in. These are the best of them. “Tidy stained glass studio, tidy mind”… adapted quote?! Anyway, it works I think. Glad to hear you’re well again. I have enjoyed and utilized points of interest from your wealth of stained glass knowledge many times! This tidbit about storage made my day, so simple but effective. I have glass stacked in various mixed containers from projects all over my work area, your storage system gives me hope for the order I have dreamed about. I wonder why I never thought of it . . . . . . Thanks for sharing!!!!! ‘Twerp’, now there’s a word I haven’t heard in a while 🙂 Glad you found the slideshow useful Annie – sadly not my studio/s this time but many good ideas to share. Thanks for telling us about your studio environs. I feel so much better as mine is also somewhat in disarray and not heated. Thanks for sharing! I don’t know why but it always helps to know that someone else is in disarray too! I’ll think of you when I tidy my studio and you think of me – that way we’ll sort it! Milly, this is so timely as I really need to get into my workshop to re-organize. Thank you!